At Nightingale Bathrooms® we offer a range of safety floorings which are available in many different colours and finishes. Safety Flooring is a vinyl flooring with slip-resistant grains throughout the wear layer which ensures a slip-resistance for the lifetime of the flooring. 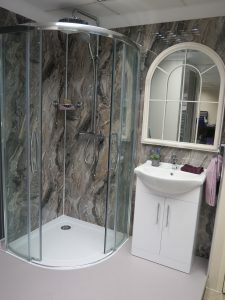 It is ideal for bathrooms and wet rooms. For wet rooms and wet floors where people could be barefoot or wearing any type of shoe, Altro Aquarius is the ideal solution. It can be used in wet and dry locations including bathrooms, shower rooms and wet rooms. Altro Aquarius provides optimum lifetime sustained slip-resistance in wet and dry environments. It's a 2mm safety floor that has been extensively tested on a variety of shower types to ensure top performance in a host of environments. No longer do you have to choose between studded or standard safety flooring. With Altro Aquarius you can have it all. Good looks and comfort, without compromising on safety. Altro Aquarius is available in 20 colours, click here to view the options. For bathrooms and shower rooms, Altro Walkway is a hugely popular, hard-wearing 2mm safety flooring which provides lifelong slip and abrasion resistance. It is a low maintenance safety floor which is easy to clean and perfect for busy areas. The range has 42 colours - featuring bright and subtle, sparkle-free designs and decorative chipped options which give you enhanced design flexibility. To view the colour options click here. When you want to create a homely, comforting and familiar look but you don't want to compromise on safety, Altro Wood Safety is ideal. The range offers 16 wood-look designs, including classic, contemporary classic and on-trend - so you can vary the mood from cool to classy to warm and nurturing. Altro Wood Safety works well with contemporary décor such as metal and glass areas, mood lighting, vibrant colours and monotone themes. It's a great choice if you need to avoid colour clashes. If you prefer the more traditional look of tiling we offer a range of floor tiles in many sizes, colours and finishes or you can provide your own and we'll install them for you. The pictures on the left show how using two different co-ordinating tile options you can define the shower area. Small, varying cocoa colour tiles have been used in the wet area and pale beige wood effect tiles have been used for the rest of the bathroom. 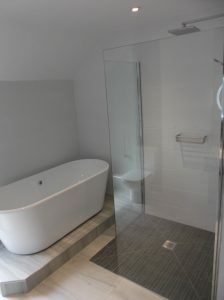 A free standing bath has been mounted on a raised area of tiling making the bath the focal point of the room. This works particularly well in a large bathroom. Nightingale Bathrooms usually install under floor heating with our tiled wet rooms which provides a warm cozy feel to bare feet. Under floor Heating comes with a wide variety of thermostat options which makes controlling your under floor heating simple. 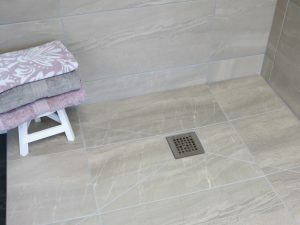 As there are so many options available with floor tiles we usually recommend that our customers visit a local company called Rovic Tiles who have showrooms in West Malling, Beckenham and Kemsing. Topps Tiles and Walls & Floors also carry an enormous variety of tiles to suit all tastes and schemes. Their online ordering service offers samples tiles so you can be sure before you place your order. Give us a call on 0800 566 8889 for more information or use our contact page.